Intermediate. Composed by Keith Snell. 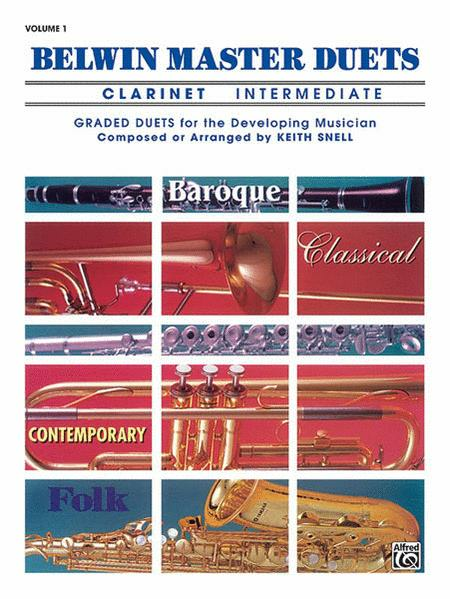 Duet or Duo; Solo Small Ensembles; Woodwind - Clarinet Duet. Book. 32 pages. Belwin Music #00-EL03272. Published by Belwin Music (AP.EL03272). A proven source of graded duets for both the student and teacher of brass and woodwind instruments. Each volume contains works from the Renaissance, Baroque and Classical periods, folk songs and traditional tunes, and a selection of original compositions by Keith Snell in a variety of styles. A useful source of repertoire. Contains: The Bells (Snell) * Licorice Stick Rag (Snell) * Lincolnshire Poacher (British Folk Song) * Linstead Market (Jamacican Folk Song) * Lopsided Polka (Snell) * The Mermaid (Ameican Folk Song) * Rondo (Mozart) * Rustic Dance (Hook) * Serenade in Four Movements (Snell) * Sonata (Scarlatti) * Sonatine (Mozart) * Three Two-Part Inventions (Bach).